It’s been too long and the pile of comics I need to scan keeps growing. I’ve been posting some photos of them over on the facebook page and on instagram but I want to get clean versions posted here. I am also in the process of signing up for a few shows and will put up a list once I get a confirmation. I believe I will be doing a couple of traditional craft shows as well as a couple comic shows. 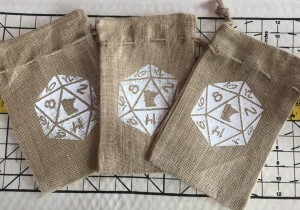 I stumbled into some cool little bags and decided to try them out as dice bags. If you see me at MSPComicon you have a shot of buying one. I have a stack of comics that need to be scanned and uploaded. I’ll try to do it this weekend.